Used Polaris ATV Parts. Where to Find the Best Deals. Used Polaris ATV Parts Guide. Guide to the Best Deals! Trying to find used Polaris ATV parts can be tough. Where do you find them? How do you know if the price is fair? Can you trust the person selling the parts? Those are all good questions. If you have an ATV salvage yard nearby, that's usually the best place to find used parts. You can see the parts yourself and it's easy to find out if the seller has a good reputation. But what if you're not lucky enough to have that local ATV junkyard? The biggest source of used Polaris 4 wheeler parts would be online auctions. And the biggest of those is Ebay. Tips - Best Deals on Used Polaris ATV Parts. I only deal with sellers that have excellent feedback ratings and a high enough number of transactions to prove they have been doing business for a while. Make sure the part is the right one for your ATV. Read the description carefully. Ask questions if you're not sure. This is also a good test to see how responsive the seller is if you're having any doubts. If the part is hard to find or something you've been looking for a good while to find - you might consider the Buy It Now option if it's offered. That way you lock in the price and others can't bid it up any higher. Make sure to check the shipping charges. If they're not posted you need to ask the seller about it. You can sometimes get a nasty surprise by shipping charges that are much higher than you expected. Although this is rare from sellers with good feedback ratings. Pay through Paypal or by credit card. Never send payment by Western Union (no refunds!). If there is a dispute, both Paypal and credit card companies have a process for solving them. We really like dealing with Ebay Stores if possible. Why? They will normally have an inventory of more parts or may know where to find what you need. If you're a repeat customer the transactions go more smoothly because you know what to expect. Stores are more motivated to give excellent service because feedback ratings are critical to their businesses. Stores with high ratings do much better. 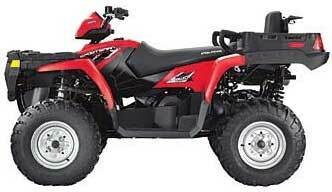 Used Polaris Parts - Highest rated sellers.